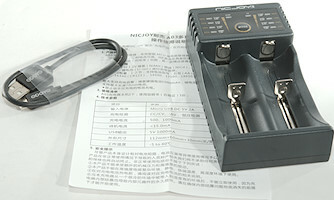 The charger model has been on the marked for some time and is sold with many different names on it. I have checked it before, but was asked to do another check. 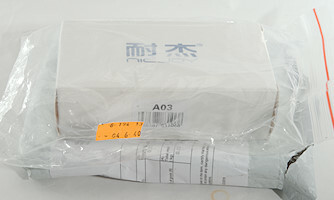 It did include a usb cable and an instruction sheet (in Chinese) in addition to the charger. The charger has a micro usb input and a full size usb output for the power bank function. The charger needs a 2A usb power supply/charger to work at full speed. The user interface is a couple of leds and a single button. 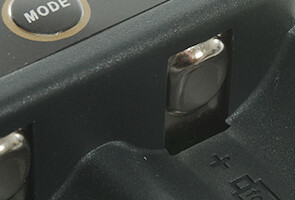 A fast press on the button will select battery type, when a battery has just been put into a slot. A long press (2 seconds) will change current at any time. There is 4 blue leds for each slot, they are used to show charge state and when selecting battery type. 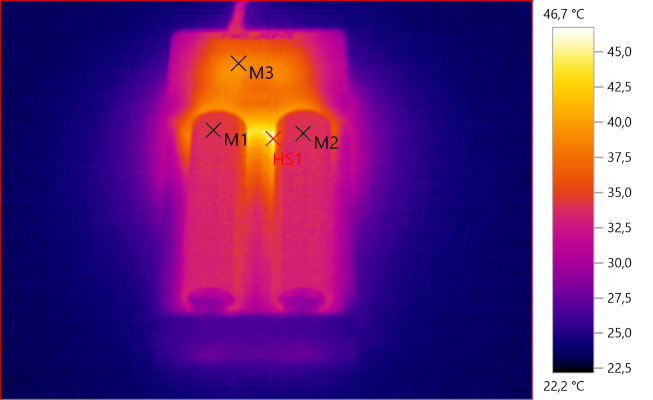 Two red leds used to show selected current. 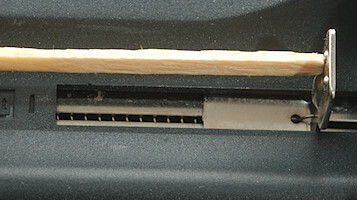 The slots can work from 33mm to 70mm. 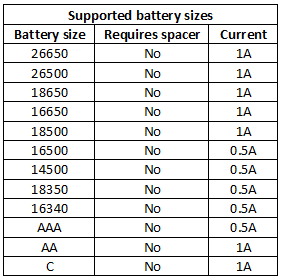 This means that very long protected 18650/26650 batteries will not fit in the slots. 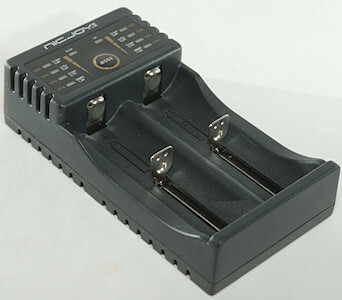 The charger has some trouble with 70mm long batteries, but can handle flat top cells. When not connected to power it will discharges with less than 0.1mA. 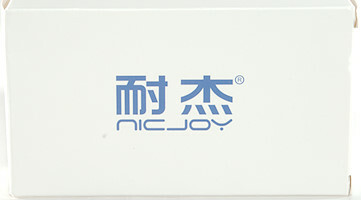 On the power bank slot it will discharge with about 0.2mA (45mA while indicating capacity). 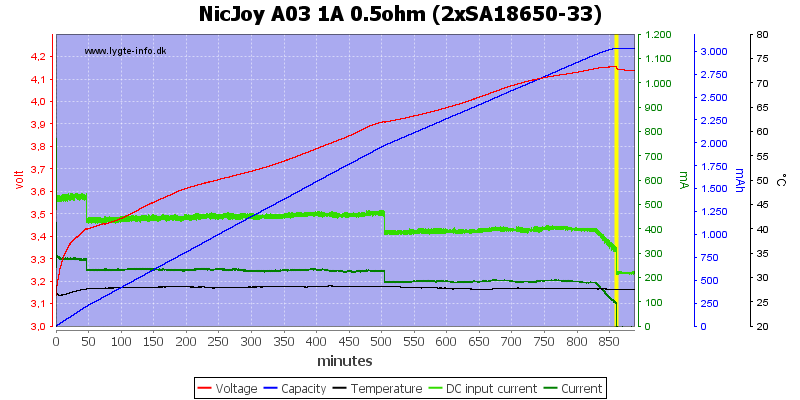 This is a fairly good CC/CV charge curve with termination a bit above 100mA. 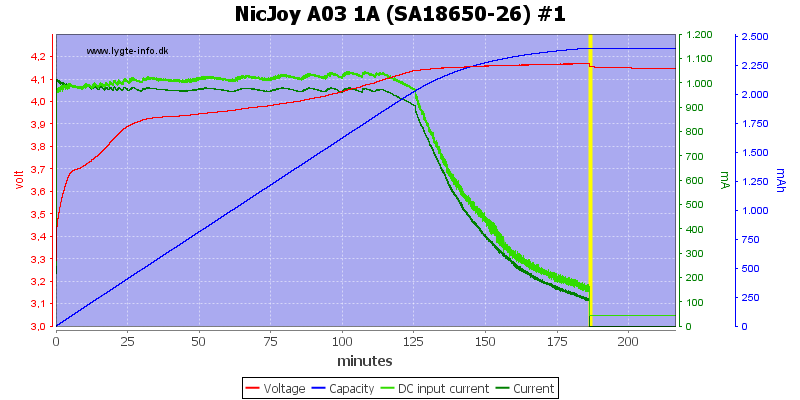 The charge voltage is at the low end of the allowed tolerances. 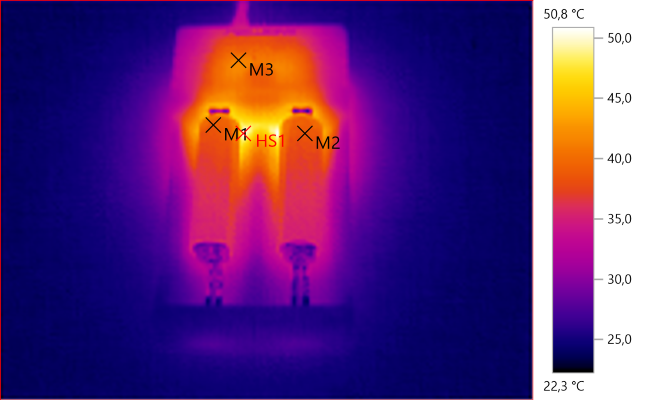 There is not much to say about the other 3 cells, they are charged correctly. 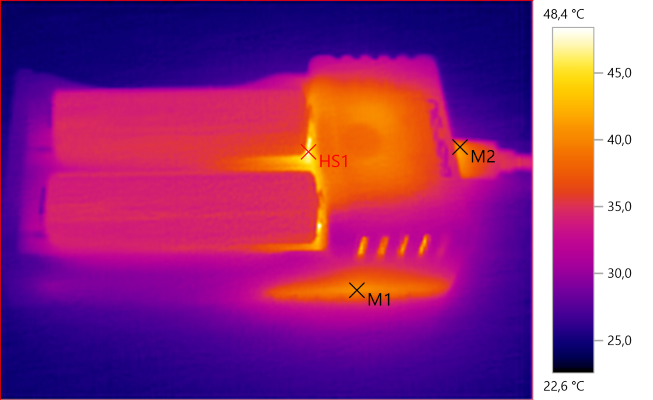 When selecting a lower charge current the termination current stays the same. The termination current is a bit high for this very old and worn cell. This cell is charged fine, but the final is a bit low. 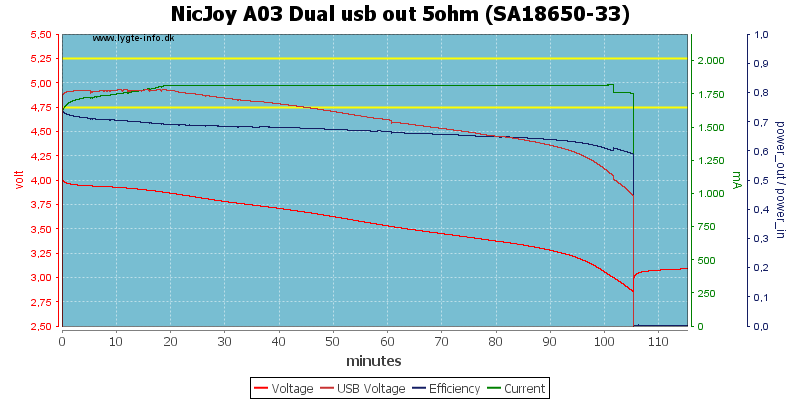 Charging two cells at a time works fine, the higher current draw on usb means the end of CC starts a bit earlier. 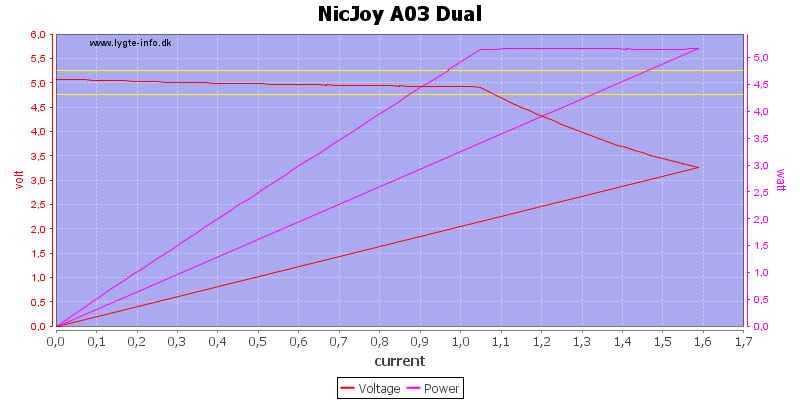 Simulating a weak power supply by adding 0.5ohm in series with it slowed down the charging considerable, but did not prevent the charger from doing a good job. The charger need some time to start, most of the time is used to wait the user to select another battery type. 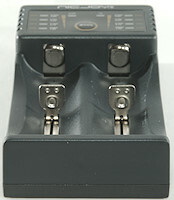 When changing current the charger always start from a low current and slow increase it to the selected level. No surprise with the 4.35V charge, it looks fine. 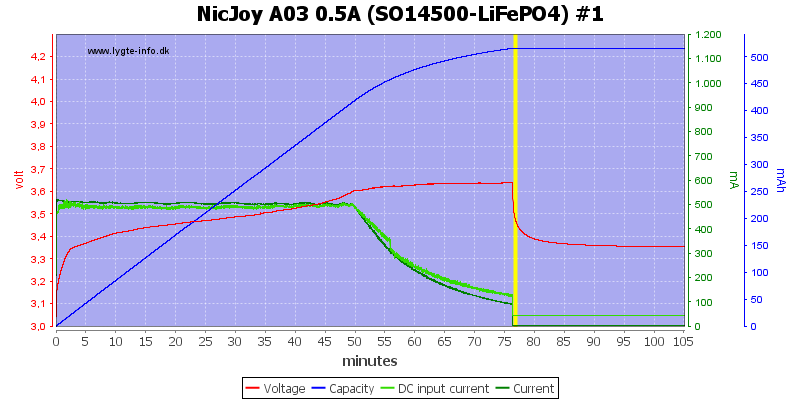 The two LiFePO4 charges also looks fine. 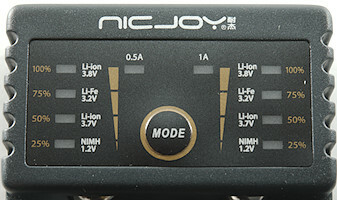 The NiMH charging terminates on voltage and do not use top-off or trickle charge. This means the cell will be slightly below a full charge. The other slot works the same way. And the eneloop Pro is handled the same way. But thic Chinese cell is terminated on -dv/dt and is fully charged. 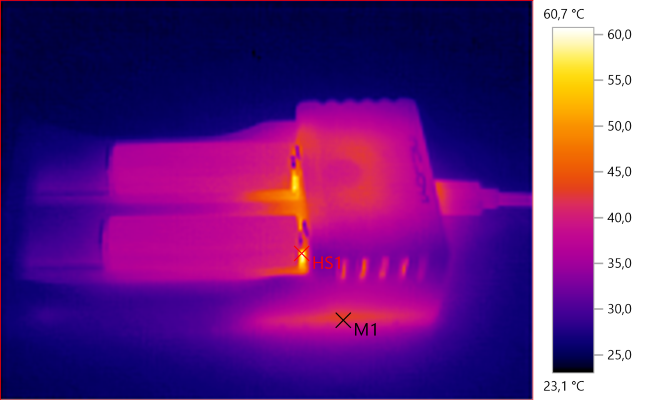 A full cell is detected fairly fast when terminating on voltage. 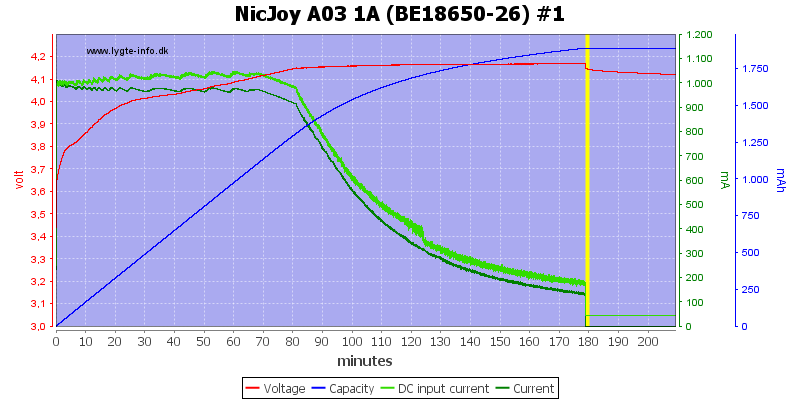 Due to the pulsing the input current is covering the charge current curve, but it can be seen that the input current is around 1200mA when charging NiMH. Same curve as above with the input current removed. 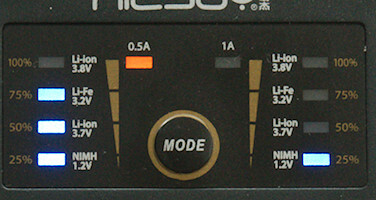 NiMH needs the same time to start as LiIon, but it is not possible to select battery type. With NiMH the current change is more abrupt. Usb output will turn off after 10 seconds with less than 45mA load. 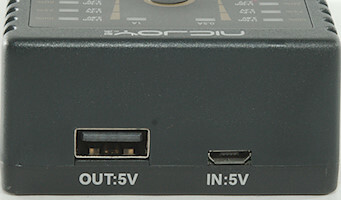 Usb output will turn off when the charger is powered. The charger can deliver a bit above 1A with a full battery. 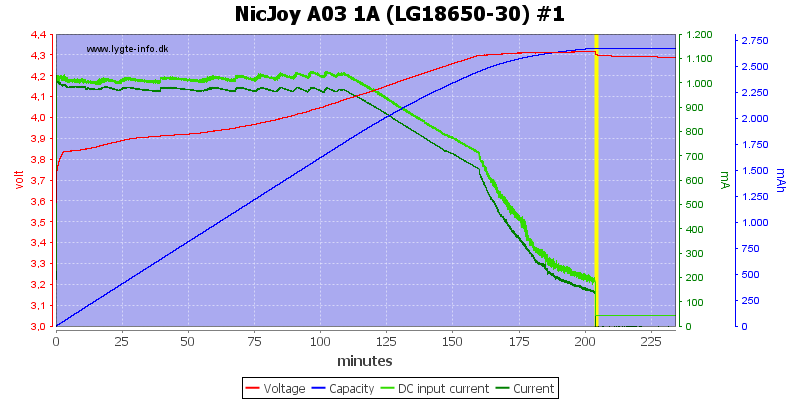 With 0.5A load the output looks nice and stable and it turns off when battery voltage is down to 3 volt. But at 1A load the usb output do not really work, the converter cannot handle a partically discharged battery. The noise is 57mV rms and 476mVpp. The noise is 91V rms and 790mVpp, this noise is a bit on the high side. This charger is good at LiIon, fairly good at NiMH and the possibility to select multiple LiIon voltage makes it very versatile. The power bank function is not very good, it uses an old coding and cannot deliver full current with a partial discharged battery, in addition to this the noise is very bad. I.e. it is a good charger, but do not buy it for the power bank function.